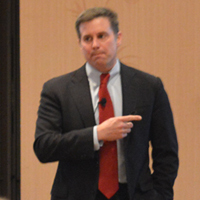 That is a memorable phrase from the keynote address, Emerging Medicaid Performance Expectations – How They Are Shaping Future Payer/Provider Relationships, given today by Brian Wheelan, Chief Strategy Officer and Executive Vice President, Beacon Health Options, at The 2017 OPEN MINDS Performance Management Institute. Mr. Wheelan provided a great contextual review of the current value-based reimbursement environment in behavioral health and social services, and then shared the “scar tissue” from Beacon Health Options’ first initiatives to move provider organization contracting to value-based arrangements. His message – value-based reimbursement has developed more slowly in behavioral health than in the rest of health care, in part because of the historically low behavioral health spending in Medicare and the lack of a robust data set quantifying the benefit of these arrangements. But, that said, he thinks “the value train has left the station” and this shift to value-based arrangements will likely continue – regardless of changes in health care policy. Beacon Options has made significant moves to shift their behavioral health provider network to value-based reimbursement. Currently, those initiatives represent less than 10% of claims paid. Based on that experience, he had some words of advice for the executive audience about clinical model development, financing arrangements, and value-based reimbursement (VBR) infrastructure development. For clinical model development, his advice was clear cut – take a problem statement approach. Be clear about the challenge your model is going to solve and develop the optimal model to solve that problem. Then determine the type of financing arrangement (from fee-for-service, to case rates, to capitation) that are best suited to support success of the model and the solution. This is a classic “solution-focused sales” approach (see Use Consultative Selling To Eliminate the Competition, Shorten the Sales Cycle & Close the Deal and Strategies, Tools & Techniques That Enable Payer-Provider Collaborations & Partnerships). On the financial side of the value-based reimbursement equation, his advice is to be specific about risk and to understand the difference between actuarial risk and performance risk (see Understanding The “Risk” In An “At-Risk” Contract). While executives of provider organizations are more comfortable assuming the performance risk of good consumer outcomes, they have a lower tolerance (and competency) for managing actuarial financial risk. How to develop the muscle for risk management: He suggested the “crawl/walk/run” progression – start small with limited risk and test systems needed to assume more financial risk on a larger scale. Mr. Wheelan’s final advice was about capabilities and infrastructure. He highlighted some major competency domains organizations need to master the move to value-based care – technology and reporting, financial reconciliation capabilities, the transfer for utilization management from payer to provider organization, and the need to maintain encounter reporting. His conclusion — VBR will cause a high degree of change in your operations, while increasing the administrative costs for both payer and provider organizations. This bilateral increase in costs will demand highly focused VBR arrangements if a return-on-investment is to be realized on both sides of the equation. VBR presents new challenges for the traditional service provider community. It brings to mind the phrase, “out of the frying pan and into the fire.” Participating in VBR arrangements will bring organizational upset by requiring new team competencies, new infrastructure, and new capital. But not participating in VBR opens the door for payer contracts with competitor organizations. This choice is clear — you have to participate, but its deciding when and how to make this change.